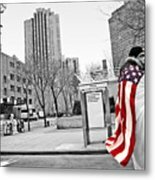 Queen duvet cover (88" x 88") featuring the image "Urban Flag Man" by Madeline Ellis. Our soft microfiber duvet covers are hand sewn and include a hidden zipper for easy washing and assembly. Your selected image is printed on the top surface with a soft white surface underneath. All duvet covers are machine washable with cold water and a mild detergent. You are so kind Joe. Thanks! 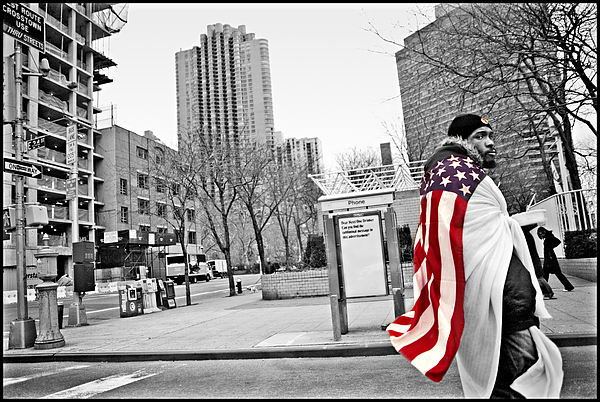 Urban Flag Man, denizen of the street. Stars and stripes your ironic coat. You wear it proudly doing the best you can, finding nightmares at the bottom of your bottle, visions no one else can share, and voices no one else can hear. 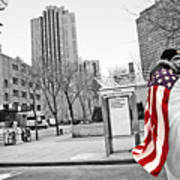 Urban flag man who said life was fair? 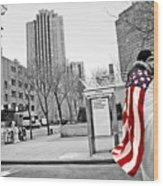 Madeline Ellis A homeless man draped in the flag struck a poignant chord with me. Perhaps you will experience the same feeling as I did, or not.